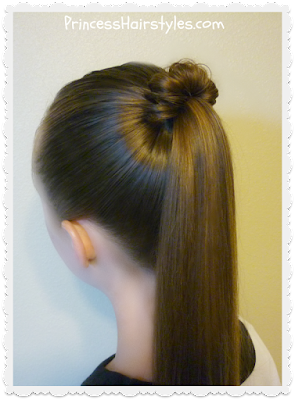 A quick and easy hairstyle, perfect for school mornings! Ponytails are a great DIY "go to" style and we all love how effortless and quick they are to make. But, if you get tired of wearing the same old thing, this quick trick adds some extra uniqueness to the classic style and changes things up a bit. Besides being fast and simple to create, the other awesome thing about ponytails is that they can be worn for casual or formal occasions. 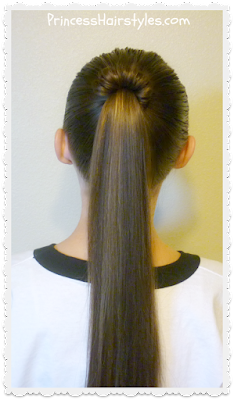 This "spindle top ponytail" would be great for sports (soccer, gymnastics, cheerleading, dance, etc.) to the gym, for school, work, church, or even to a prom or homecoming dance. This cute hairstyle could also be worn as a half up ponytail if you prefer and should work with most hair types and textures: Long hair, medium length hair, and even fairly short hair.... curly, wavy, or straight. If your hair is on the shorter side, I would recommend using several sections of hair to make the loops instead of one continuous strand. 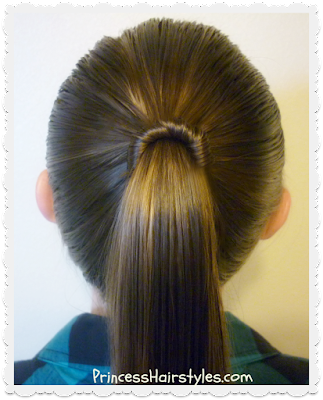 Pictured below is another option, showing how this ponytail could be worn without stretching the hair out. I think this variation looks pretty cool, sort of like a ponytail holder made out of hair! Topsy tail. (As mentioned in our video, if you don't have a topsy tail you can wrap the sections around the hair tie by using just your fingers. But, we have found that the topsy tail does make things easier.) These can be found online here: Topsy Tail link (affiliate) or in some stores where beauty supplies are sold.